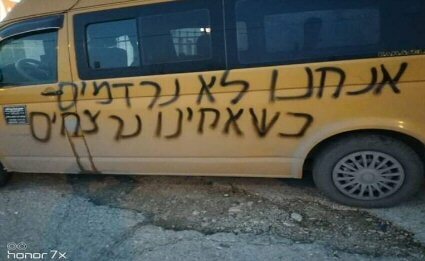 A group of settlers carried out, on Wednesday at dawn, a series of attacks against Palestinian properties in Battir village, to the west of Bethlehem. The mayor of Battir, Tayseer Qatoush, said that the people of the village were shocked by racist slogans painted on the walls of one of the mosques and some vehicles. The graffiti was signed by “price tag” groups. He added that the tires of some of the vehicles were punctured and that racist slogans, against Arab and Palestinians, were painted on it, threatening to carry out more attacks against Palestinians . Price tag gangs are a religious right-wing movement that officially appeared in July of 2008, Al Ray further notes. The group has carried out many attacks against Palestinians, such as setting fires to their homes, painting racist slogans on their property, and attacking mosques.